Ellington and fans, backstage at the Graystone (date unknown). 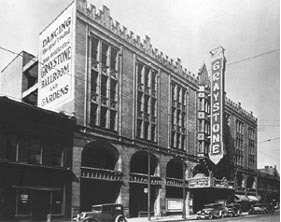 The Graystone Ballroom, exterior (date unknown). The Graystone Ballroom, interior (date unknown). 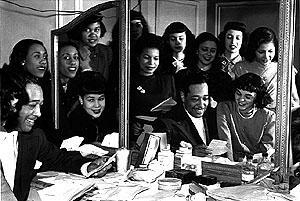 When Detroit Danced to the Big Bands - at the Detroit News, pix of the Graystone and other venues. 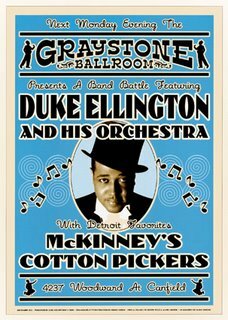 Stompin' at the Graystone: Jazz in Detroit 1917-1940 - at the Internet Public Library. Felix, IN A MELLOTONE is indeed a great song for every day! I really enjoyed the Stompin' at the Graystone piece -- particularly the references to the mighty McKinney's Cotton Pickers and Jean Goldkette Orchestra, both of which figured very prominently in the Detroit jazz scene of the late '20's.